It’s a bittersweet feeling. Another incredible summer at camp has come to an end. Luckily, not everything about summer has to come to an end! This year campers learned a wide range of skills and values that will benefit their academics, relationships at home and even future college applications! It’s such heartwarming experience to see each and every Waukeela girl shine bright at camp. Every girl follows her own path of growth, but a few key 21st century skills are obtained for each camper across the board. At Waukeela, community and sisterhood are at the core of our values. With each activity, event, campfire, song, cheer and dance there’s sense of belonging. This feeling of belonging is especially important for first year campers, since leaving their families can feel a little nerve-racking at first. That’s precisely why the development of our community is so important at Waukeela. Every girl has something special to contribute. Every girl is free to try new things and express herself. And most importantly, every girl is an essential part of our loving sisterhood. Deep in this little slice of paradise we call our summer home, another beautiful gift blooms. Whether your daughter is artistic or logical, adventurous or reserved, she found something special this summer: her voice. Every activity at Waukeela opens a door for your daughter to explore, envision and create in her own unique way. 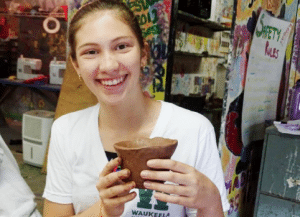 Art class isn’t the only place Waukeela girls find their creativity, either. 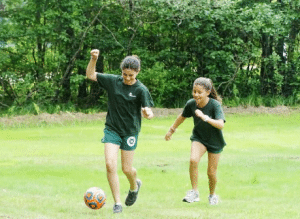 Team sports like soccer and tennis challenge girls to strategize and collaborate in creative ways to win the game. While performing arts classes like drama and dance help girls find their voices on the big stage. Now that summer has come to a close, you’re probably starting to think about all the new stresses the academic year will bring. Luckily, your daughter probably left camp this year without even realizing all the critical thinking skills she earned this summer! How could she notice when she was having so much fun? Since these skills are developed in all kinds of activities around camp, your daughter became a sharper problem-solver each day! Living in the bunks with girls of all backgrounds and interests helped your daughter consider different perspectives and resolve disagreements in a positive way. Trying out new activities helped your daughter re-evaluate her beliefs on certain activities. For example, your daughter likely tried out a few different activities out of her comfort zone this summer and enjoyed the reward of it! All of these 21st Century Skills will help your daughter on her path to success this year. 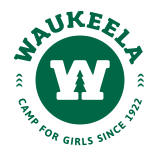 We are already so proud of what each girl accomplished during her time at camp – we can’t wait to hear all about her year next summer at Waukeela!